If there can be no ahistorical justification for weapons research, then all attempts at justification must be historical: they must refer to the situations and circumstances in which weapons are actually used. In view of the general condition for all such justification, in terms of harm prevention, it must be the case that the harms caused by the use of the weapons produced must also prevent harm, and moreover, the harms caused must not be excessive and the harms prevented must at least be comparable to, and preferably much less than, those caused. But the problem here is that weapons designers cannot know what is going to happen in the future when it comes to the ways the weapons they design are used (if indeed they are ever used). If they cannot know what they must know in order for their work to be justified, then justification of weapons research will not in fact be possible. I am going to spend this chapter and the next making good this claim. 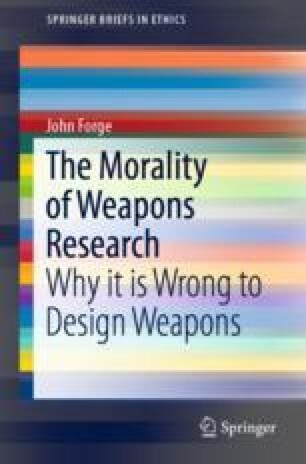 If I am able to do so, then I will have shown that weapons research is never morally permissible: that is to say, in no circumstances and under no conditions is it ever morally acceptable to undertake weapons research. The case against weapons research will have been made. JWT has been compared and contrasted, by Orend for instance, with Realism on the one hand and Pacifism on the other (Orend 2006: 4–5). The difference between the three in regard to war is (roughly) as follows: JWT holds that war is morally permissible under certain conditions, namely, those set out in the theory; Pacifism denies that war is ever morally permissible, while Realism maintains that morality has nothing to do with wars nor any other kind of relations between states (cf Carr 1946: 153). Pacifism and JWT resemble one another in applying a moral standard to war, but differ in that the former’s is stronger. For the Realist, war may be necessary or expedient, depending on whether it defends or promotes the vital interests of the state, nothing more. My own view is that Realism is the correct account of what wars are and why states go to war, whatever statespeople might say. I have given no argument in favour or against either of the other two theories as the correct normative account of war, and, moreover, as should be clear by now, my argument against weapons research does not presuppose either theory, in that it has no premise drawn from either of them. I have focused on JWT because it is more permissive in regard to war and hence one would suppose it would allow (some, or more) weapons research. We have seen that it does not. My argument against weapons research is therefore consistent with JWT, but does it give us any reason to prefer it to Pacifism, or conversely? Pacifism and JWT evidently differ in terms of what roles they allow for armed forces and the weapons they wield: JWT allows that armies, etc., can go to war to resist aggression, but Pacifism in the traditional sense does not. This in itself, however, does not imply that Pacficists must maintain that states cannot have armed forces, it is just that they cannot use them to fight wars. This might seen spurious until we remember that weapons can be used to deter, to prevent others starting wars. A pacifist deterrent threat will be empty because war is not permissible, but that does not mean that it could not be efficacious. In this way we can see how Pacifism can be consistent with weapons research, namely with weapons research done with the intention of providing the means for deterrence. We have established that deterrence is a derivative function of a weapon and that there is no such thing as ‘purely deterring’ weapons, and hence any pacifist-sponsored weapons research would still have to produce the means to harm in order to obtain the means to deter. One might expect Pacifists to also maintain that threats to violence are impermissible and hence that deterrence is also not allowed. Nevertheless, it appears that Pacifism simpliciter and weapons research are strictly speaking incompatible, in the sense that the denial that war is ever morally permissible does not imply that weapons research is morally impermissible. There are versions of Pacifism that do not deny that participation in all wars is morally wrong, something that Orend for one finds ‘strange’ (Orend 2006: 244), with one such variety, known as contingent Pacifism, being of current interest (for example, May 2011; McMahan 2010) . It is worth saying a little more about this idea here. The point about contingent Pacifism is that its starting point or main premise is not that war is always forbidden. It is rather than wars are very bad indeed, and should only be undertaken if it is clear that they will prevent outcomes that would be very much worse than the war is. This is a stronger demand that there is just cause and that the proportionality condition is satisfied.12 However, and here we do see some resemblance to my position, since one can never be sure that this demand is satisfied, in practice it entails a prohibition on all war, hence the Pacifist stance is contingent . If there were a complete cessation of weapons research, given that everyone were to accept that it is morally wrong, then this would eventually lead to world in which it would look as if everyone was a Pacifist because there would no longer be the means to fight wars, so no one could fight and there would be no more war. This not contingent Pacifism as such because the argument does not depend on any judgement about the rightness or wrongness of war. However, since the contingent Pacifist holds, in effect, that the ad bellum proportionality calculation cannot be carried through, then she and I share the same view on this issue.